Distinctive, intelligent and sensitive, socially complex and so powerful but yet so kind, elephants are part of our global heritage. Elephants are crucial to the biodiversity of the ecosystems that they inhabit. But the two species of elephants, the Asian and African elephants, are both at high risk due to the loss and degradation of their habitats and increasing poaching. According to sources, less than 500,000 elephants remain in the wild, from a population of 26 million estimated in the XIX century. The numbers are overwhelming as elephants are being killed in record figures: it is estimated that one elephant is killed every 15 minutes. The demand for ivory is on the rise and it is fueling illegal trade. 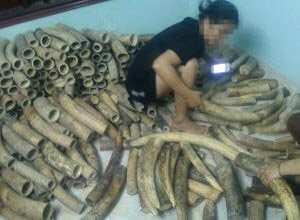 As an example of the work that we conduct, during our investigation in Nhi Khe, Vietnam, our undercover operatives were shown with wildlife parts deriving from up to 907 elephants with a total worth of US$6.8 million. In November 2016, we convened our first Public Hearing concerning the eighteen-month investigation, resulting in a Case File with more than 5,000 pages of detailed evidence against 51 subjects. This overwhelming body of evidence documented staggering levels of illegal wildlife trade of different species, conducted with apparent impunity. We are running out of time and the protection of elephants is now more urgent than ever. They are irreplaceable. Image: Traders showing our undercover investigators 480kg of ivory.